Grand Canyon, Ariz. – Floyd E. Roberts III of Treasure Island, Fla., remains missing in a remote area of western Grand Canyon. Responding rescue teams and resources to date include ground teams from Grand Canyon National Park, Grand Canyon-Parashant National Monument, Mohave County, Coconino County Search and Rescue, and aerial support from Mesa Verde Helitack Crew and aircraft. 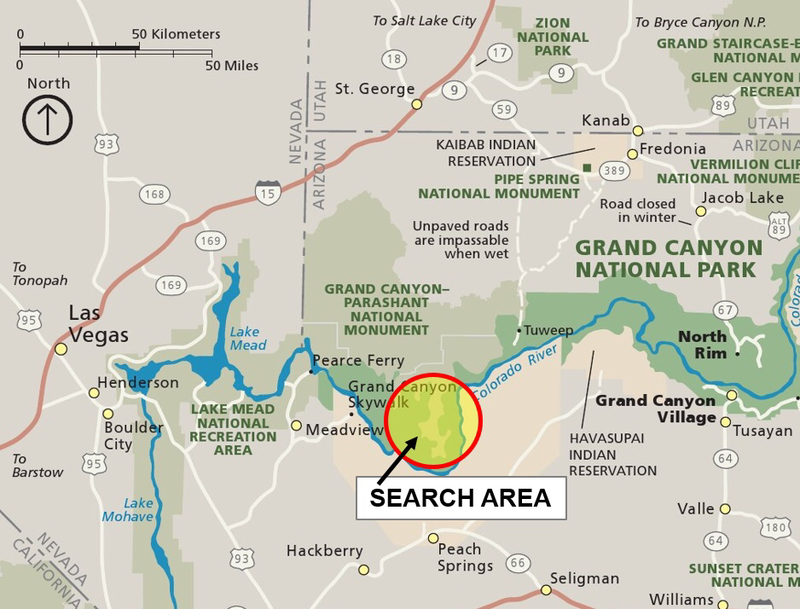 The search area covers over 10 square miles and is in an extremely remote, rugged area of the canyon. Transportation to the area takes several hours and has made rescue operations and communication a challenge. Roberts is described as a 52 year old male, 170 lbs, 5’11” tall, brown/grey hair, brown eyes and was last seen wearing a red long-sleeved shirt, blue denim jeans, multi-colored mesh Nike Free sneakers, large blue Lowe Alpine Contour backpack, and white-rimmed sunglasses with orange lenses. Last week, hikers found the wreckage of an airplane and the remains of its pilot in the Grand Canyon area. Positive identification is pending, but National Park officials said they believe the aircraft is the same one reported missing in 2011. Based on the plane’s description and tail number (N650RV), it appears details about the disappearance are noted here on LostFlights.com. Here is the National Transportation Safety Board’s entry on the missing flight. Grand Canyon, Ariz.- On May 20th, a private boating trip reported the wreckage of an airplane to park rangers at Diamond Creek. The boaters informed the rangers that during a hike near Emerald Canyon at Colorado River Mile 104 they found the plane with human remains inside. Inclement weather prevented rangers from responding to the scene via helicopter until Sunday, May 24th. Rangers first recovered the remains, which await identification from the Coconino County Medical Examiner, then packaged the plane in a sling load and recovered it using a long-line. The wreckage matches the description of an airplane that went missing in 2011. That plane, a red RV6 homebuilt experimental aircraft, was last seen at Grand Canyon Airport around 8:30 am on Friday, March 11, 2011. The NPS used both a fixed-wing airplane and a helicopter in search efforts at that time, covering 2,000 air miles over a 600-square-mile search area. Civil Air Patrol’s Nevada Wing, Coconino County Sheriff’s Office, and the Air Force Rescue Coordination Center assisted in that search. Search activities continued on a limited basis after April 1, 2011. No further information is available at this time, as the Coconino County Medical Examiner works to identify the remains and the National Transportation Safety Board investigates the incident. Grand Canyon, Ariz. – Twenty-one year old Kaitlin Kenney of Englewood, Colo., remains missing in Grand Canyon National Park; and an extensive search by the National Park Service has turned up no additional clues as to her whereabouts. Kenney was last seen Friday, Jan. 11, at a river camp located near Tapeats Creek on the north side of the Colorado River in Grand Canyon National Park. Rangers used the park’s helicopter to search the river corridor and area trails for two days after she was reported missing. In addition, ground-based search and rescue teams thoroughly searched the accessible trails, beaches, drainages and backcountry areas in the vicinity. With no additional clues to guide search efforts on land, the decision was made to scale the search back to a continuous, but limited mode in which rangers and pilots will continue to search for clues when in the area. In addition, flyers with Kenney’s picture and description remain posted at popular river trip launch and takeout points; and anyone who may have information regarding her whereabouts is encouraged to call the park tip line at 928-638-7767.